View More In Ethernet Cables. Ultra Slim and Flat to improving the look of your home or office. With just 0.05 inch thin, the flat cable makes it easy to fit between spaces, which are perfect camouflage underneath carpets, walls, or even behind furniture. Cat6 flat Ethernet cable is capable of transmitting data at speeds of up to 1.0Gbps over 100m run of cable. Compared to Cat5e cable, the improved quality in twisting of the wires provides better immunity from crosstalk, noise, and interference that can degrade the signal quality. It is made out of 4 unshielded twisted pair (UTP) of copper wires with two RJ45 connectors on each end. RJ45 connectors offer universal connectivity to computers and network components, such as routers, switch boxes and network attached storage devices. Also for ps4,ps3,xbox gaming and other game. NOTE: Your network speed is determined by many factors ,which include the cable, your router, switch boxes, other network components, and also service provider. -- LIFETIME GUARANTEE for replacement or full refund! Lifetime Technical Support. 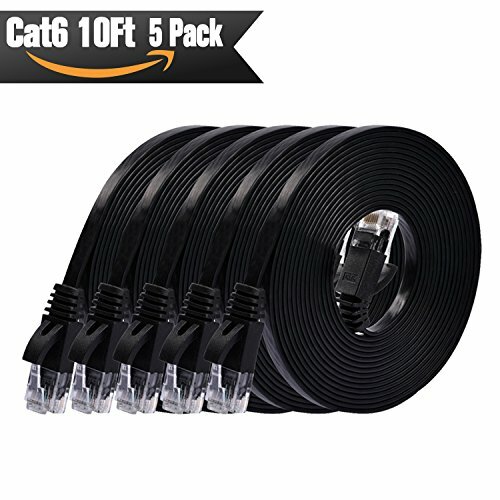 ✔Cat 6 cables are made of 100% bare copper wire.The connectors with gold-plated contacts, molded strain-relief boots, and snagless molds resist corrosion, provide durability, and ensure a secure connection; Bare copper conductors enhance cable performance and comply with UL 444 specifications for communications cables. ✔LIFETIME GUARANTEE for free replacement or full refund! 24 hr Technical Support! Why not try the best product and customer service ? If you have any questions about this product by CableMonsta, contact us by completing and submitting the form below. If you are looking for a specif part number, please include it with your message.